Alpine Ascents: 3 guides, 8 members, 8 Sherpas- names on the link. Hello everyone, team reported that the entire team is standing on the summit of Everest, as ben mention it was a great summit day not to many peoples, no wind and sunny. Team starting to summit from 6:27 till 7:28 they are going to take photos and starting to decent to south cool soon. Thank you for staying with us. Will be updating from camp for tonight. Not sure how I can say this differently than I have for the last eight days, but yet another good day on Everest – with over 40 summits combined both sides. But all of the joy is muted with the death of Japanese climber Nobukazu Kuriki who was descending from Camp 3 on the Nepal side and died. He had been suffering from a high fever and cough all season long. Here is the full report with as much as we know. This morning one of our VIP member Mr. Li Jianhong climbed Mt. Everest along with two more Chinese members Mr. Lyu Jun and Ms. Qu Jiaojiao between 5:30 to 5:50 AM. Ms. Qu Jiaojiao also climbed Lhotse on 20 May together with Jian Chang (China). IMG reports they had 10 members and 13 Sherpas support staff on the summit. 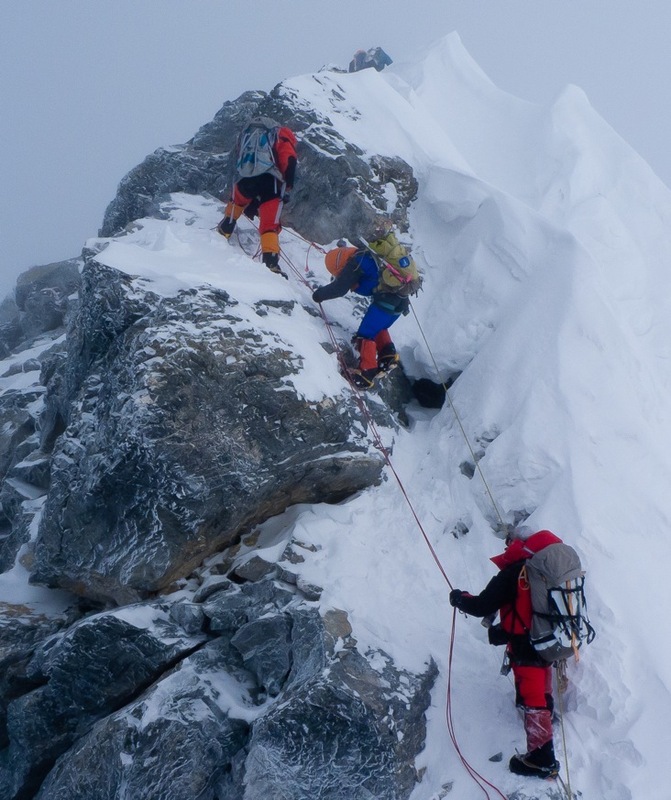 Mountain Professionals had four members and 4 Sherpas on top. So maybe the history of commercial, guided Everest expeditions has to be rewritten? 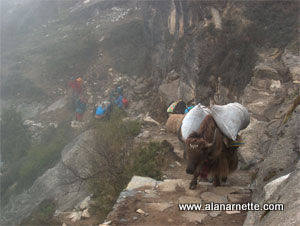 At least a new climbing style was established to the Everest guiding community. Finally, after almost 40 years of standstill without any significant innovation. This is the first time that a whole guided team summited Mount Everest in such a short time (21 days from home) with the help of an acclimatizing program at home. This comes with an increase of safety and a 100% success rate. Not to forget that our Flash members are no professional athletes, they are dentists, consultants or entrepreneurs … Thank you to all climbing community for all the criticism and skepticism, it kept pushing motivation to move on with this idea. Lukas added a few more details with a message to me today that he felt his 21 day trip was unique and not comparable to anything else anyone had ever done. That he had “real” members. And “members started to use O2 individually in different altitudes – 6600 -8000, one member started only at 8000m. the 8l/min were not used and are only for emergency situations. On summit day all were climbing between 3-6l/min,” Congratulation to Lucas on his victory. They had one guide, four members and 8 Sherpas summit. Hillary Step HAS CHANGED: The Hillary Stairs? 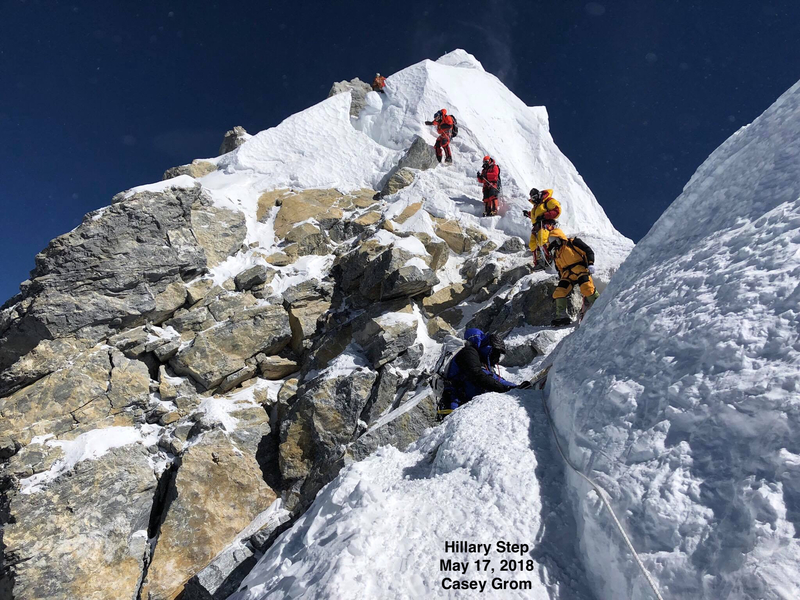 Mike Hamill sent me this photo of the Hillary Step taken by guide Casey Grom. It is more like stairs now than an off-width crack. The Hillary Staircase? Click on the image and zoom in for a close inspection. See this recent post where I discussed the controvesery where guides said it had changed but the Nepal Ministry said it was just snow covered. One of the reasons I wanted to get this photo was to show the silliness of the Nepal Ministry of Tourism telling climbers and guides this year, 2018, that they were “not allowed to talk about the Hillary Step.” Once again, not sure of their motive as mountains change all the time. While this is an iconic part of an historic route, being transparent about the change only enhances their credibility, otherwise they will continue to struggle to get rules through that will increase safety, reduce crowds and deaths. Alpine Ascents, IMG, and Summit Climb are climbing now on the south side and Altitude Junkies is one one only teams left on the North side. Its good that most teams have compiled their climbs as a typhoon is developing near the Bay of Bengal. The center for forecasting them predicts a full-on storm in 24 hours. While it won’t hit Everest directly, it will influence the jet stream and perhaps bring winds back to the summit. Well done to all thus far. I love the Hill . . .
Best of luck all Climbers . . .
My english not a good . I will try write english . . .
Alan – please, am curious as to what height do you believe Everest to be? Do you happen to know if that is referenced to a rock or snow surface? In 1841 the Great Trigonometric Survey led by Welsh surveyor Sir George Everest identified the location of the mountain. Fifteen years later using trigonometry and measurements from 12 different survey stations around the mountain, Indian Radhanath Sikdar, a member of the survey team, finished the calculations and determined they had found the world’s highest mountain. They called it ‘Peak XV’ and noted it was 29,002 feet. In 1865 it was re-named Mt. Everest, against Sir Everest’s wishes, even though for centuries the Tibetans had called it Chomolungma. The Nepalese finally gave it their own name in the mid 20 century as Sagarmatha. In 1955, the height was adjusted to 29,028′. On May 5, 1999 a National Geographic Society Expedition put a GPS receiver on the summit. Using a second Trimble GPS receiver at the 26,000′ on the South Col they made an extremely accurate measurement by running the two receivers simultaneously. The new altitude was measured to be 29,035 feet or 8,850 meters. However, the Nepalese still use 29,028′ (8847m) as the official altitude. And the Chinese use 29,015 (8844m). The difference being if you count the snow on top of the rock at the summit or not. I still don’t know how they measured the ever changing snow depth. Thank you Alan. Am setting out to do Pike’s Peak via the Barr Trail (and staying 2 nights at Barr Camp) next week per your recommendation. Going with a bunch of other Florida flatlanders that are just getting into climbing – looking forward to it! Enjoy Wes. I was there a few weeks ago and then trail is in great shape – but crowded! Your coverage this year has been fantastic. Thank you again for it. Awesome photos and commentary! I am too old, but next year I will do the base camp trek to get a sense of the magnitude.